Long Axis Antler tine with rounded end, suitable for punches, carving, small percussion work, indirect percussion, and pressure flaking. These come longer than 6 inches with tine point still attached. 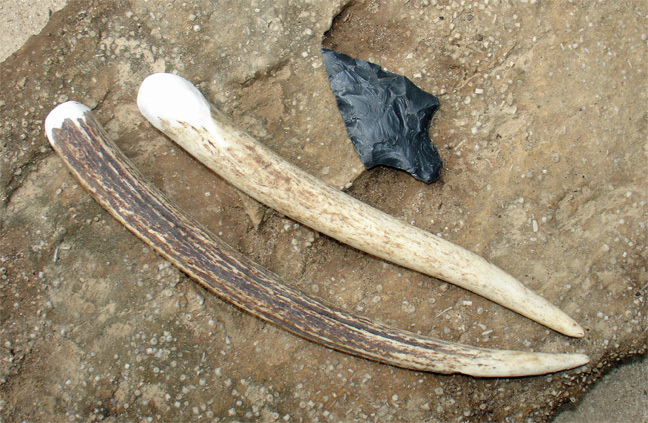 This billet is light but the solid Axis antler will percussion flake small obsidian, dacite and heated stones fairly well. Decent for work up to 3 inches, the weight limits the length of flake that can be removed. This is a good billet for someone who wants to whack a stone or 2 to see what knapping is about.